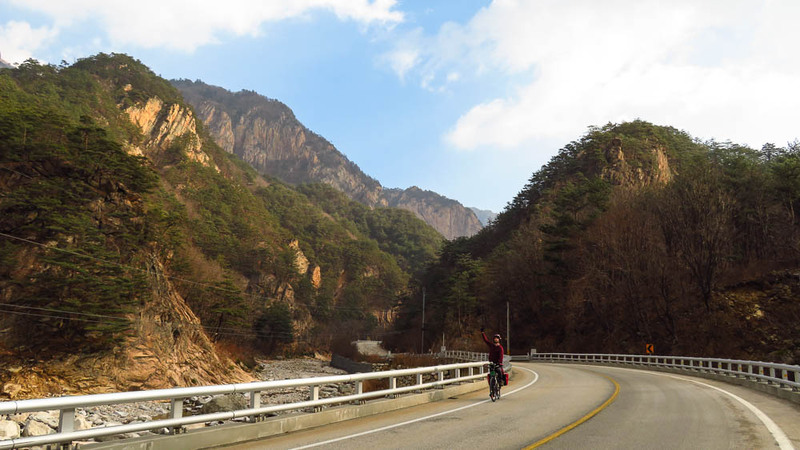 With winter approaching, we decided to take one last cycle through Korea before it got too cold for comfort. 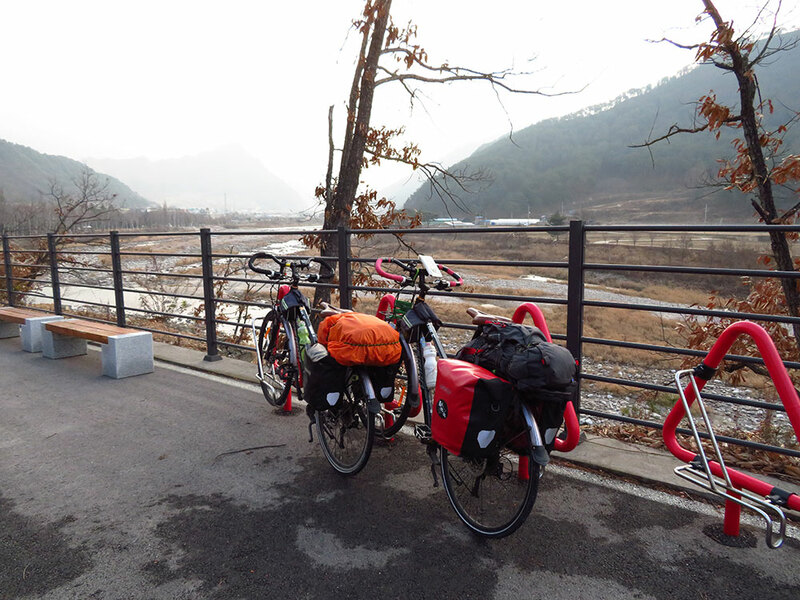 We spent about a week cycling from Seoul to Yangyang. 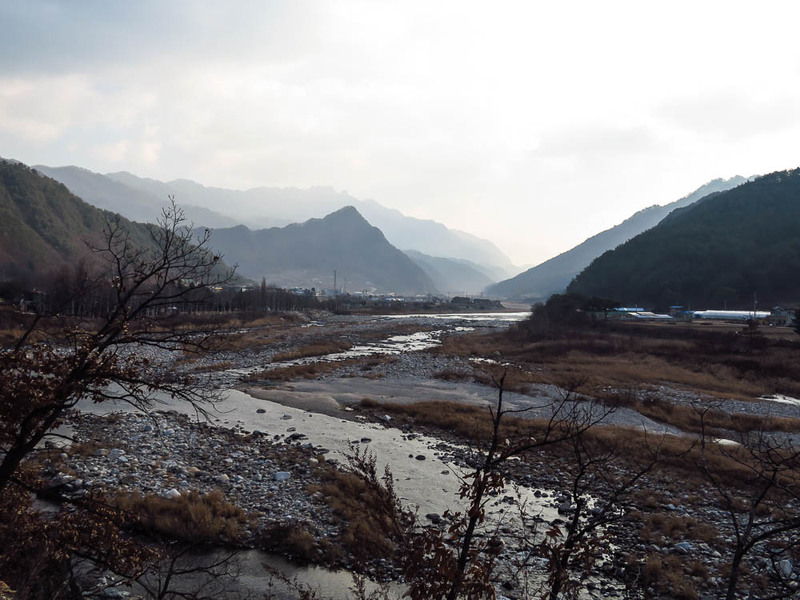 It was a path that took us close to the De-militarised Zone and the border of Kim Jong Un’s grotesque playground. This is probably a good place to mention that we didn’t actually cycle the whole way. Declining weather and increasing generosity gave us a free ride in a truck for one leg of the journey. In saying that, it was mostly cycling. It was two weeks since we’d been on the bikes in any meaningful way. 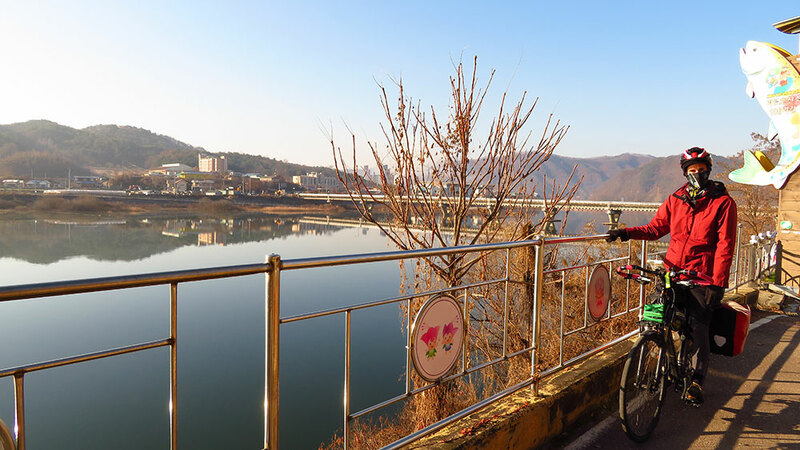 Our time in Seoul consisted of three things: Securing all the visas necessary for our further travels (Russia, Mongolia, China); eating as large a variety as possible (Seoul is an culinary paradise); and doing the opposite of difficult cycling (easy nothing). With that in mind, we decided to go easy on our first day back in the saddle, and spent a slow day escaping the city with a ride to Munsan. This felt like the real beginning of our journey. The previous day had simply been a slog out of Seoul. We awoke in our discreet little motel and breakfasted on cereal. Morning cereal has been a recent addition to our cycling journeys. It’s cheap and light, and daily milk can be found almost anywhere. We munched away and planned out the route for the day. Since the maze of the city was behind us, we could now switch to Google maps. You can’t plan routes properly with Google maps in South Korea, but there is a baseline map to work from and you can star all the major turns. This is still much better that trying to use Korea’s mapping app ‘Naver’ without an internet connection. The morning was chilly, but we were prepared. The temperature wasn’t going to get much higher than 5 degrees, and it promised to regularly drop to around -7 degrees (Celsius, you savages). We wore thermal underwear, warm pants, fluff-lined pullovers, and our trusty Earth Sea Sky jackets. I still wore the same tramping shoes I’ve been using since the blistering heat of southern Japan, but Caroline upgraded to some fluffy waterproof boot things. Despite the chill and our numb extremities, it was a brilliantly sunny day. We were heading north, which meant the low, winter sun was behind us. It also meant the cold was probably going to increase. 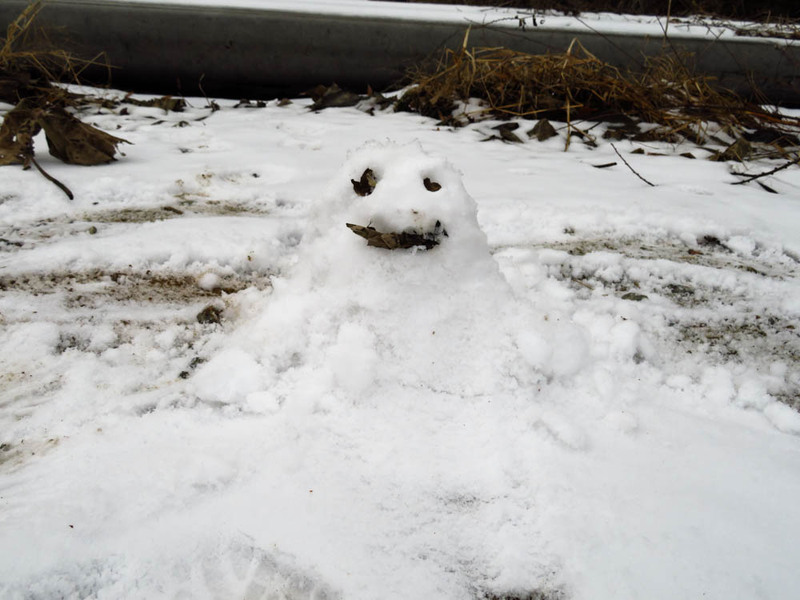 We were only half a week from the official start of winter. A sporadic bicycle lane was laid out for large chunks of the journey. Occasionally official signs would point down a road that led nowhere, and we’d have to backtrack. Once, the bike trail sign pointed up a leafy bush walk. We tried to ride up, but it was far too steep and rocky for us and our gear. When the proper cycle path did appear, it was bliss. There were no other riders to be seen anywhere, so the few dozen kilometres of dedicated bike way were all for us. However, when we were forced back on to the road, it was a high-speed truck fest. We knew we had between 70 and 100 km to travel, and so we kept a relaxed, medium pace. Lunch was Haejangguk, or ‘hangover stew’, which is different depending on where you order it. Our choice of dining establishment was a little restaurant in the middle of nowhere. It was clear that it was a popular spot, because most of the tables were covered in hundreds of dishes from the recent lunch rush. The woman cooking was very happy to see us, and kept refilling our condiments, offering us little extra things like raw duck eggs, and pouring coffee into paper cups with plastic holders. The stew was hearty and warming, filled with vegetables, tofu, and pork. After all the rice and side dishes we were happily stuffed, and then took off at a slow, satisfied pace. 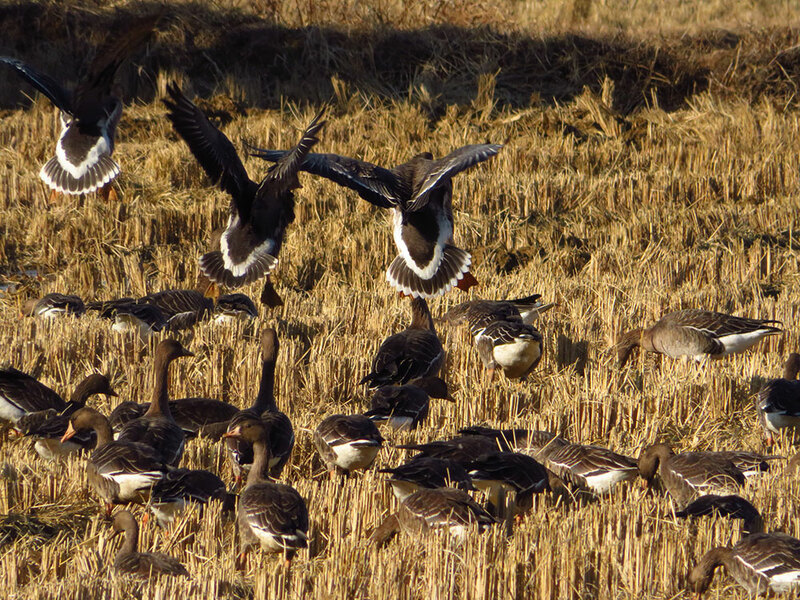 Greater white-fronted geese landing in a bare paddy field. 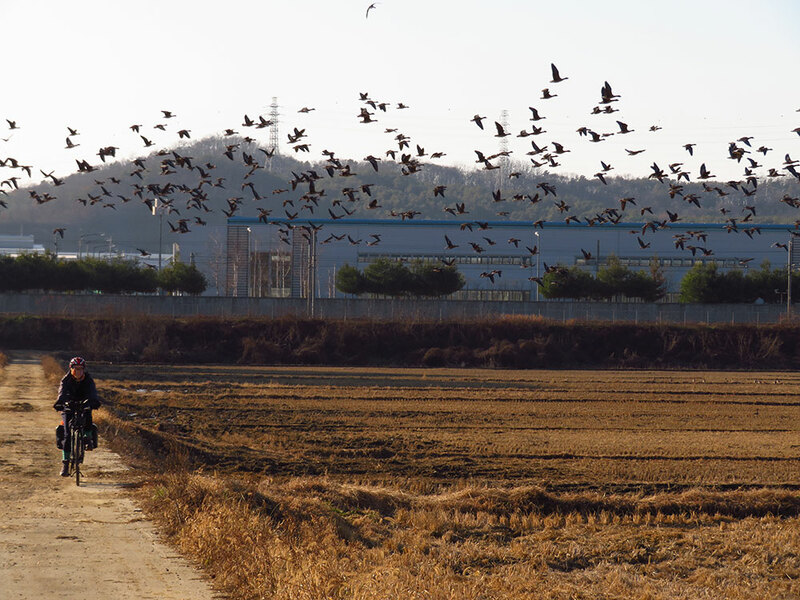 It’s migration time, and Korea is one of the places they end up during winter. 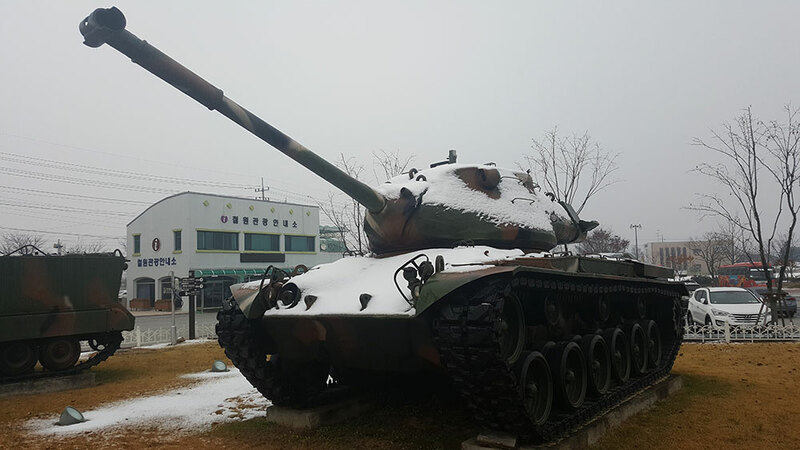 As we got closer to North Korea, the military presence was impossible to ignore. Soldiers in groups sang jogging songs, practised escaping one at a time from tanks, or just stood around with rifles joking to each other. 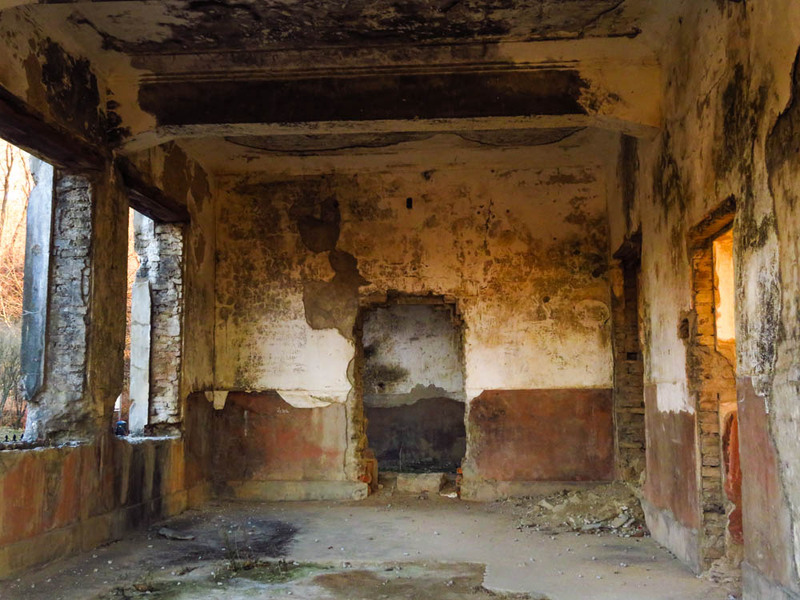 Helicopters flew overhead, and jeeps carrying camouflaged personnel rumbled by. In South Korea, military service is compulsory for all men and optional for women. The latest they can enlist is directly after university, and they must serve for two years. 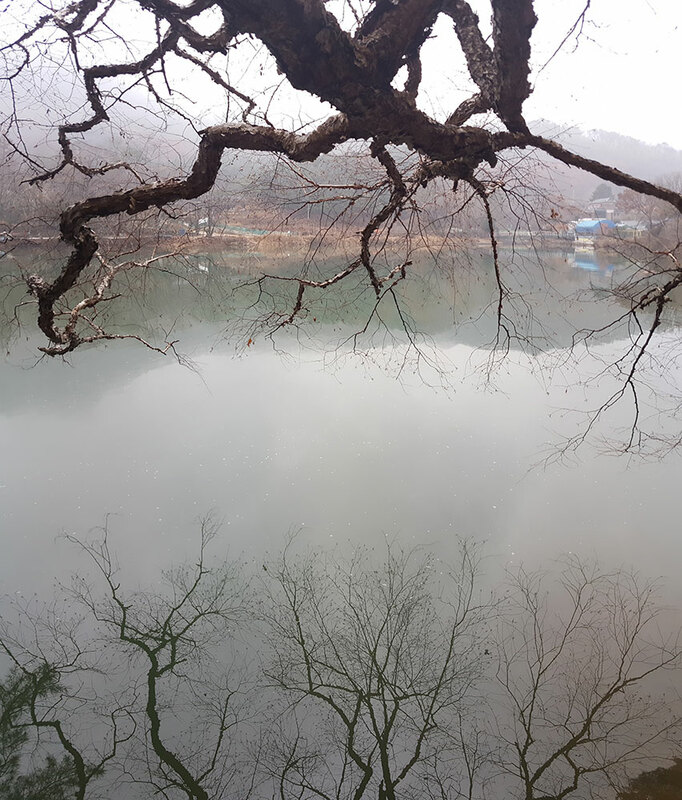 Back in Seoul, we were lucky enough to chat with an ex-soldier. He was happy to share his tales of being posted on the border at the DMZ. Most people choose to be in the army, but there are also options to join the navy and Air Force. The guy we spoke to joined the army, so we asked about his training. We asked if it was hard to sit though all that violent propaganda. He said no, it was just a history lesson. “We were posted in the DMZ. We stood along the line and watched the border. The coldest it got was -35 degrees, but we couldn’t choose what to wear; we had to dress however they told us. Usually it was two hats, a thick jacket, nothing on the face, thermal underwear, and two pairs of socks. We had to walk up hills to get to different posts, and I’d sweat during the walks. When we stopped, the sweat would freeze. I’d have to scrape ice off my body. “We had these trays of food,” he replied, making a little box shape with his hands, “And you pulled a bit of string to heat them up. When you pulled it, it made a lot of steam and became hot quickly. We had to eat our meals at the time we were given them; we couldn’t save them for later because everything was regulated. The food wasn’t technically ours, it belonged to the Korean people. “Were you allowed to eat the meal anyway?” we asked. 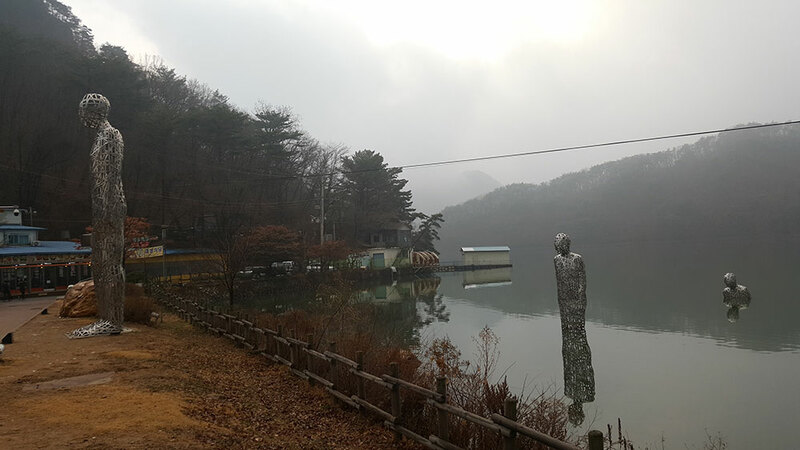 Recently, there had been news in South Korea about the giant speakers they have at the border. These speakers blast propaganda over to North Korea, shrieking about how much better life in the south is, and intermittently blasting K-pop. As of this writing, the speakers had been recently reintroduced after a period of downtime. So this was interesting. If they were blasting propaganda about how much better South Korea is (which I assume is quite accurate), then what would happen if a North Korean defector wanted to cross over? Would they be allowed to simply enter? We asked our ex-soldier friend. I should say here that I’m not sure how accurate that last part is. It seems extraordinary, but that’s what we were told. 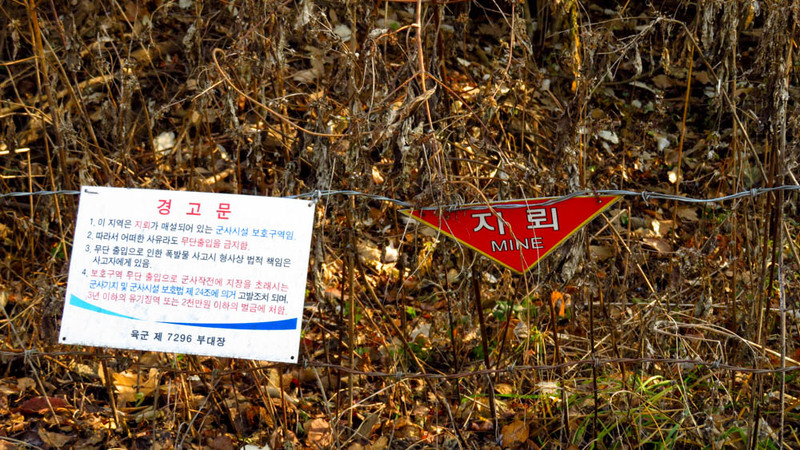 In 1968, over 60,000 anti personnel mines were deployed in various parts of South Korea near the DMZ. Many have since been removed, but according to this article there are still around 3000 unaccounted for. 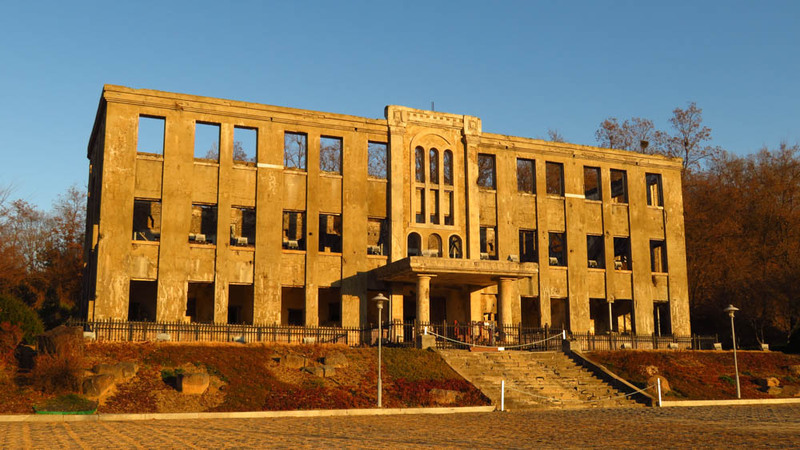 This is the bombed-to-hell remains of the North Korean Labour Party headquarters in Cheorwon. 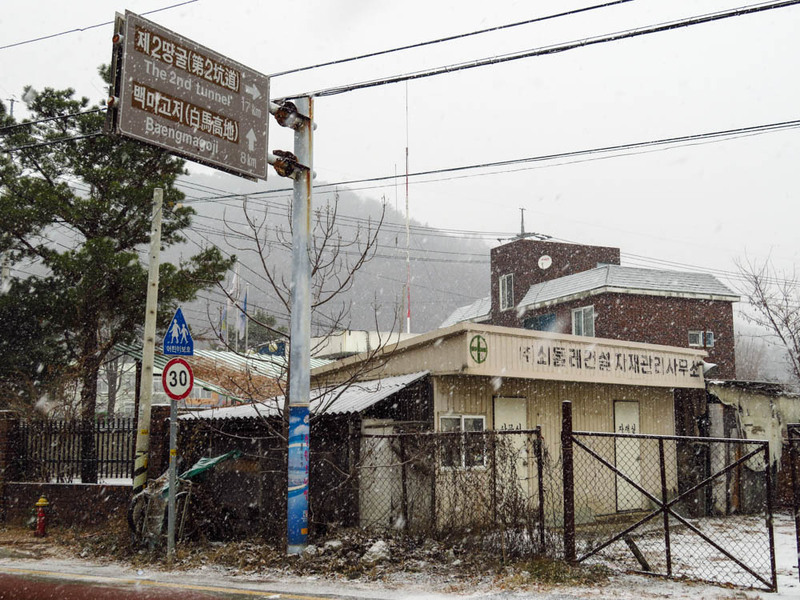 A sign at the site speaks of tortures and atrocities committed within its walls. Stretching on the bike path. We were very lucky to see these guys. 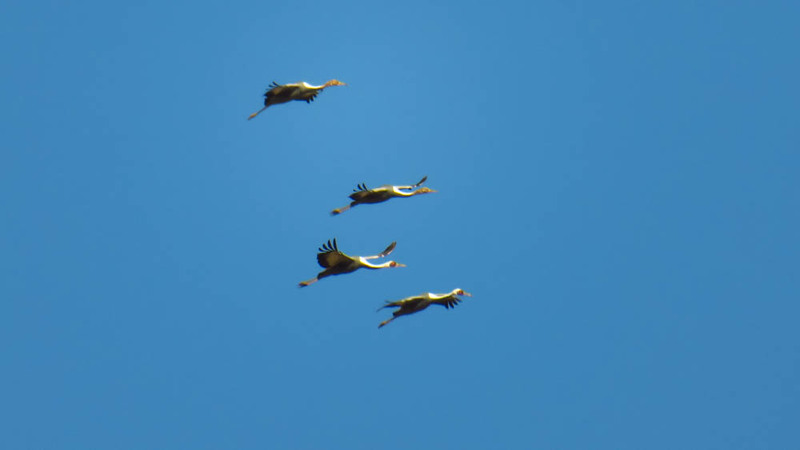 They are White-naped Cranes, and there only 5,400 left in the wild globally. 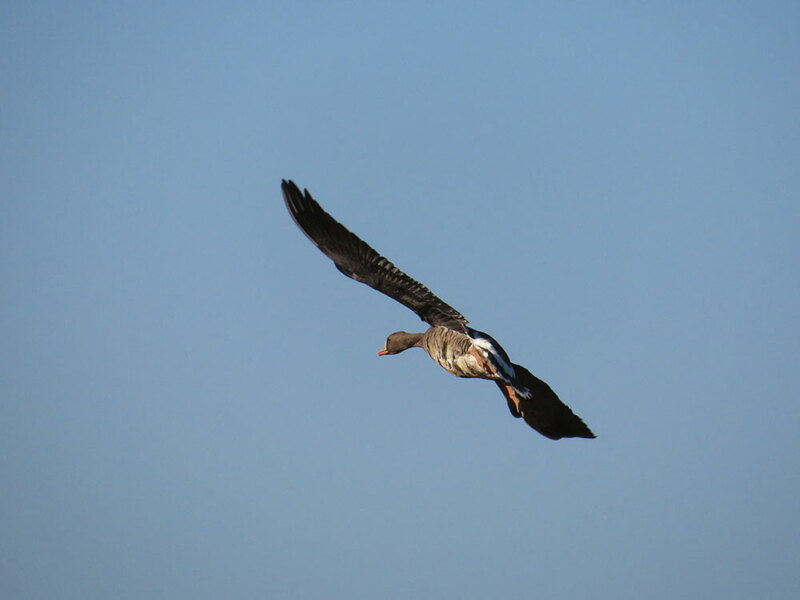 They were flying high, so we could only get a few blurry, zoomed-in photographs. Our shadows were getting longer and longer as we cycled. This usually marks the start of two things: good light for dramatic photos, and the uneasy knowledge that darkness will soon arrive. Luckily for us, we found our accommodation just before the darkness hit. The place we were staying was the home of a host we found on Warm Showers. He told us that he wouldn’t actually be around when we arrived, but his mother was happy to have us stay. She was even looking forward to it. She came to greet us like old friends, removing us from the cold evenin and leadingus g into her warm apartment on the outskirts of Cheorwon. In New Zealand, having a heated floor is a luxury that nobody I know can afford. In Korea, it’s standard practice. We happily settled into our room while the numbness slowly wore off. Our host, who will hereby be referred to as Mum, could not speak a work of English. 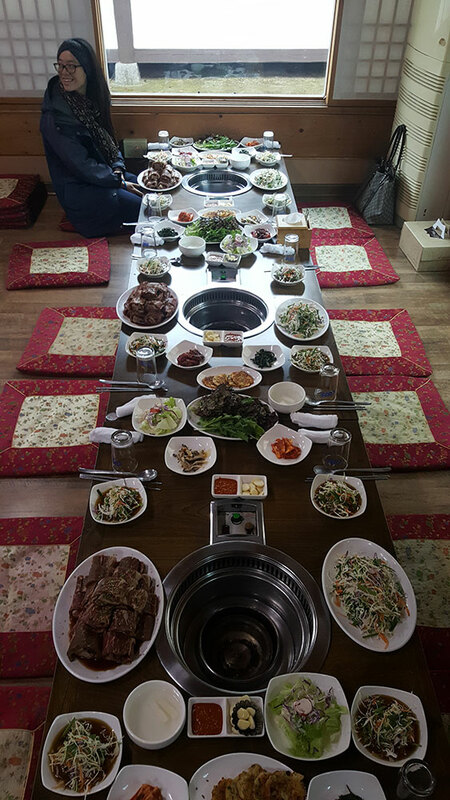 This was no bother – even though I spoke practically no Korean and Caroline was limited to a few basic phrases – because Mum was about to become the best host ever. She pulled out a bit of paper where some phrases had been written down in Korean and English. “Feel at home”. “You can have everything in the refrigerator”. Help yourself”. Mum then plonked us down at a table and began dropping plates of home cooked food in front of us. Marinated pork. Kimchi. Lettuce with apple (a surprisingly good combo). She watched, satisfied, as we ate, and bustled around the kitchen telling us what else we could eat. There was an abundance of fruits, beverages, yoghurt, noodles, pickles… oh yes. This was going to be memorable. After dinner we tried to wash the dishes, but mum wasn’t having a bar of it. She wouldn’t let us anywhere near the sink, and when she was done she led us on a voyage of discovery through the house, pointing out where to wash our clothes and ourselves. After mum had seen to our every need, it was time for her to leave. She was a social worker who did night shift, and she wouldn’t be back until late the next morning. She looked at us fondly before departing, like we were helpless chicks, and then left us alone in the cosy apartment. We slept for much longer than usual, and didn’t get out of bed until 10 a.m. Mum had just arrived back from work and already had a feast prepared. Our breakfast would be her dinner, and she made sure to feed us until we were stuffed. Just when we thought it was over, I was reminded of Caroline’s family force-feeding me, because mum suddenly pulled four large pork buns from a steamer. She told us we needed to eat more, making fat motions around her stomach. It was then that we realised it was snowing outside. This was quite a contrast from our previous sunny day cycling, and it was a wonderful sight for two people who rarely see snow. Mum went to bed (after washing the dishes and refusing help), and we put on all our cold-weather gear to go outside and gambol in the snow. A few hours later mum awoke, and asked us how long we were planning to stay. We’ll probably leave tomorrow, we said using Google translate. Two more days, Mum replied, You are my son and daughter! And so we accepted. Before mum left for work in the evening, she ordered a huge box of roast chicken for us. The delivery man showed up at the door. We tried and failed to pay for the chicken. Mum then noticed my shoes outside the door and tut-tutted. The laces were untied, and she mentioned it in the tone of somebody patiently telling their child that the underwear is supposed to go inside the pants. She loosely did up the laces so I could slip my shoes on and off without having to untie them. These are the things in life that I just don’t think about. After eating, we settled in to watch some Korean TV. It was Saturday, so the big news was the weekly protest in Seoul against President Park and the ongoing scandal. I briefly mentioned this scandal in my last post, but to find out more you should do a Google search. It’s fantastic stuff. The news was claiming 1.9 million people protesting this time, and scenes showed a wall of police in riot gear facing a wall of protesters. This is usually a recipe for disaster, but the whole situation seemed very relaxed and peaceful. 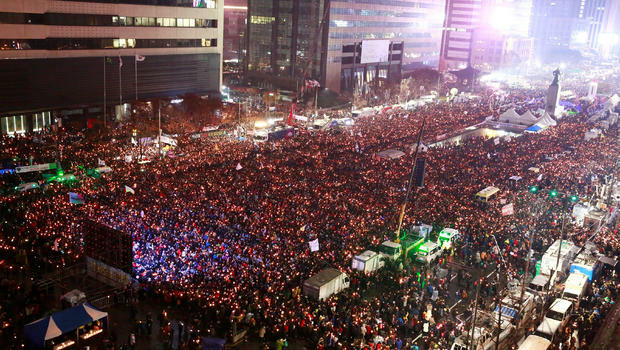 As a contrast, the news showed scenes from previous Korean protests decades ago. People hurling objects and running from tear gas was a key difference in these old videos. It was a nice reminder that protests can be peaceful, even when there is a genuine reason to be upset. In fact, the protest seemed to be turning into some sort of fun event. Scenes showed musicians performing, and at least one giant whale balloon. The next day it was mum’s dad’s birthday – so it was grandad’s birthday. We began the day with a trip out to a nearby river. It was beautiful after the snowfall, and a boatman led us up the river in a little motorised dinghy. Our fellow passengers were a man and his slightly hyperactive wife. She spent most of the journey laughing loud enough to scare the birds, and yelling at the people ashore. This was outside a museum. Sorry to disappoint. Grandad’s birthday feast was… this. 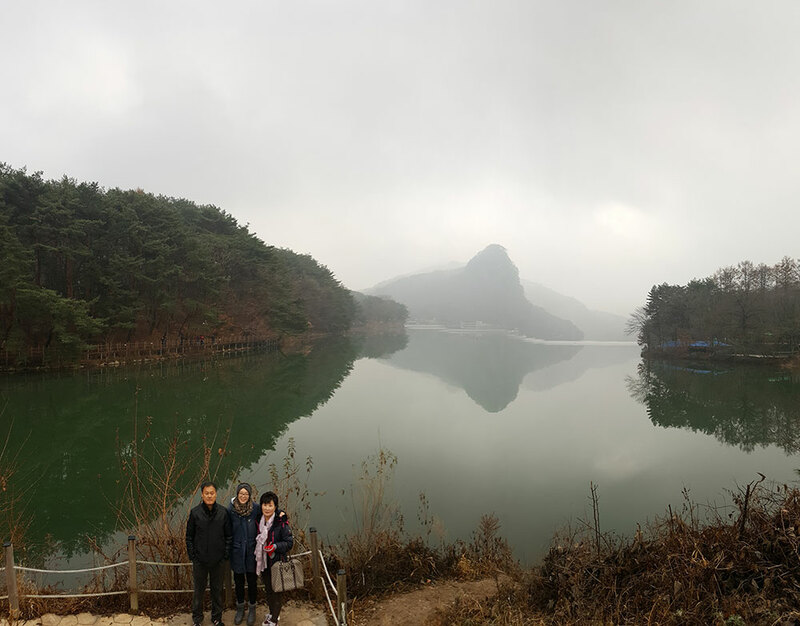 Caroline, Mum, and Dad at Sanjeong lake. We spent a couple of hours walking around this lake after grandad’s epic birthday lunch. We woke up in our toasty room, and began packing for the cycle ahead. But when we saw Mum, she began to speak rapidly in concerned tones. 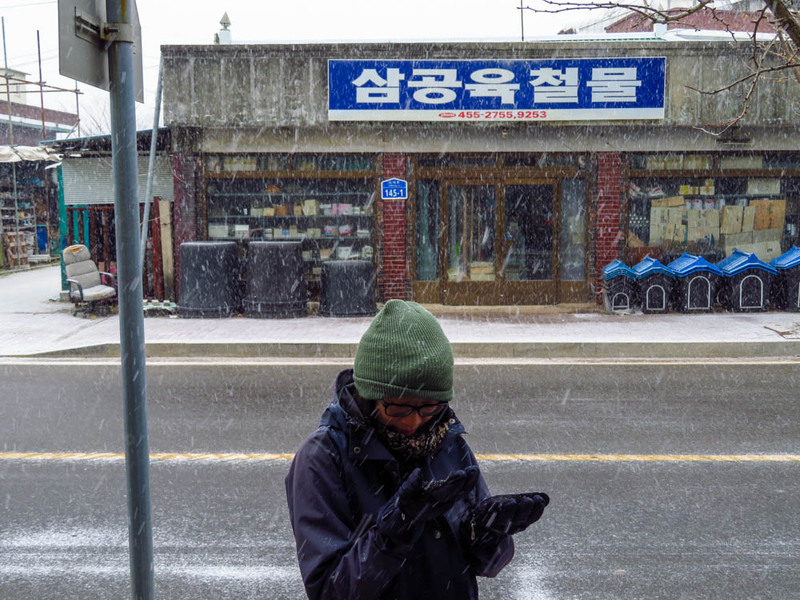 Through Google translate, we learnt that she wanted to drive us all the way to Hwacheon. It wasn’t safe to cycle, she said, because of the thick fog. We looked out the window and saw that it was indeed a very thick fog. We didn’t really mind cycling in it, but Mum insisted. It would be Dad that would drive us. Dad had appeared sporadically over the few days we’d been around. He too spoke no English, but he was a warm, quiet man who made us feel welcome. We agreed gratefully, and waited for Dad’s truck to leave at 2 p.m. By that time, the fog was gone and the day was sunny, but we still took them up on their offer. The drive over the snowy mountains was beautiful, and I managed to see small patches of that beauty in between sleep. Four-wheeled vehicles have a very strong tendency to send me into dreamland. We enjoyed a final late lunch together in Hwacheon, and then said goodbye to our generous, temporary parents. Just as they were about to drive back home, mum had an idea and made us follow her to a general store. There, she went through the aisles trying to buy lots of things for us. We declined as much as we possibly could, but still ended up with a carton of milk, eight pots of yogurt, and a block of chocolate. This sort of generosity is unprecedented. This section details two days at once, since they were both relatively short cycles. We probably could have done the whole thing in one day, but it would have been unpleasant due to all the mountains in the last 30 km. 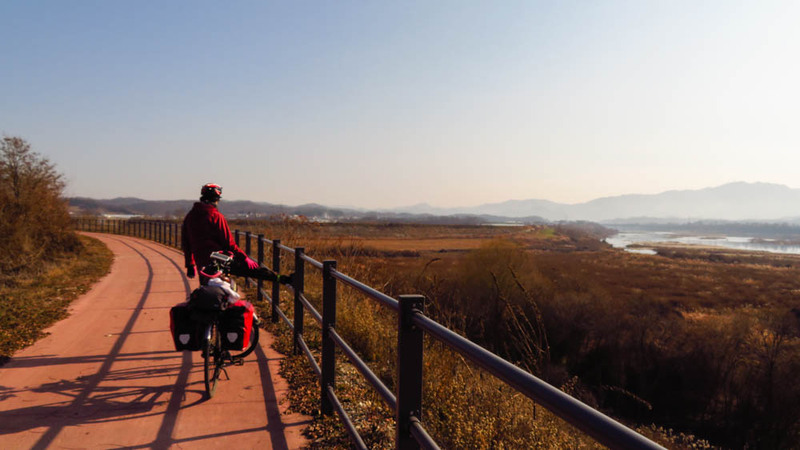 The blue sky was back again, and a nice, empty cycle path stretched away from Yanggu. 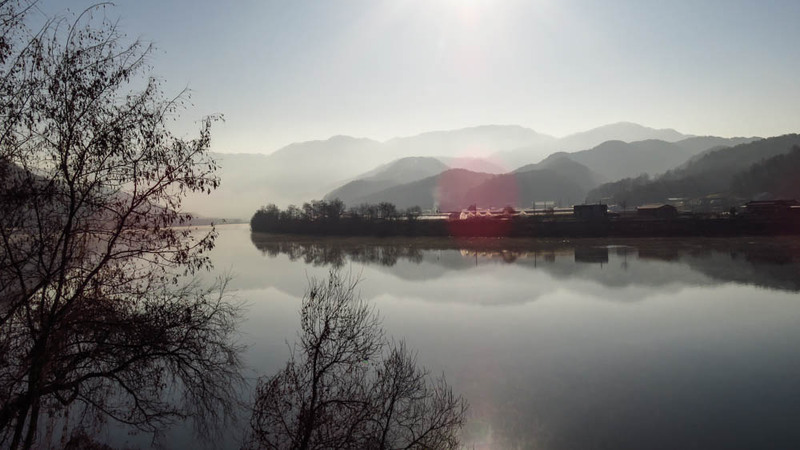 It followed a misty river for several kilometres before veering off, then climbed a short but steep hill and found another river to follow. Hilltops still had dregs of snow, but it had mostly vanished from the ground. Traffic was sparse, and most of the vehicles we saw were military. 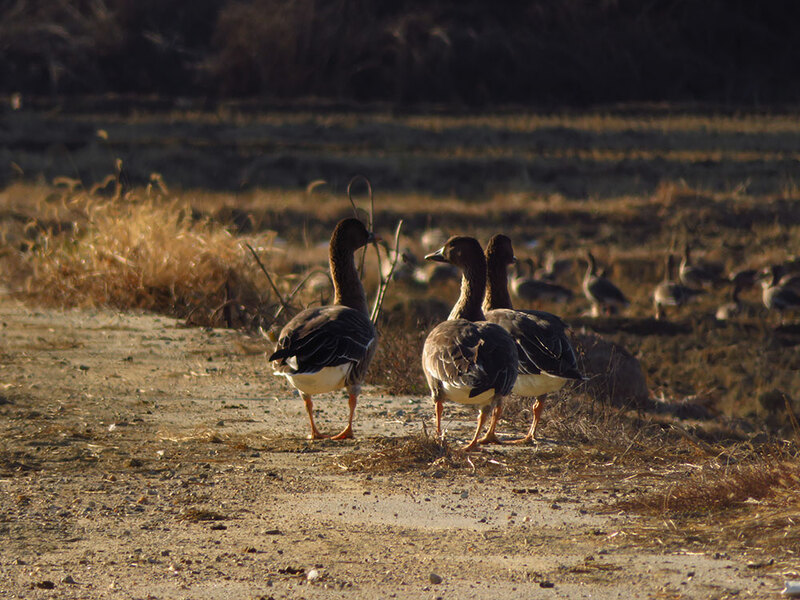 The day was punctuated by geese heading south, frozen ponds, and automatic rifle fire in the surrounding hills. The second day held the majority of the steep climbs, but these were made easier by a string of long tunnels totalling almost 5 kilometres. 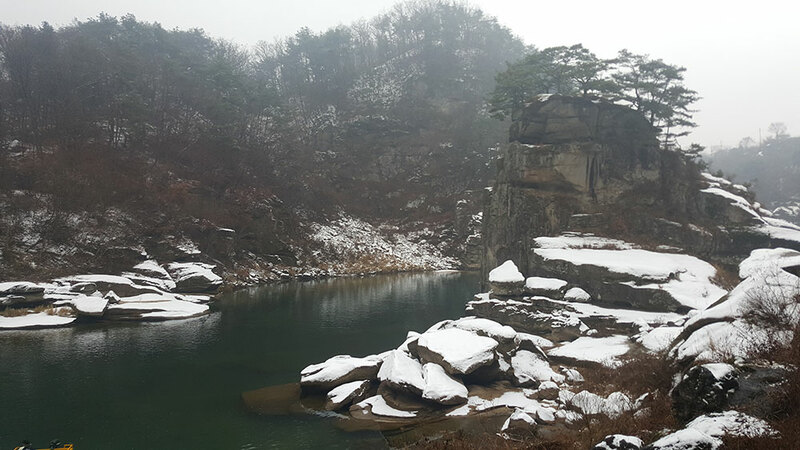 It rained a little in Buk-Myeon, which proved that the temperatures had risen enough not to snow. 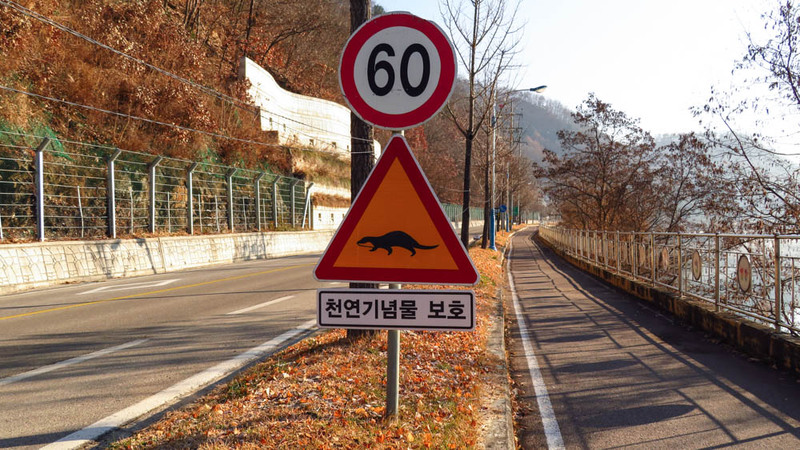 Much like the ‘penguin crossing’ signs back home, we didn’t see any actual otters crossing. 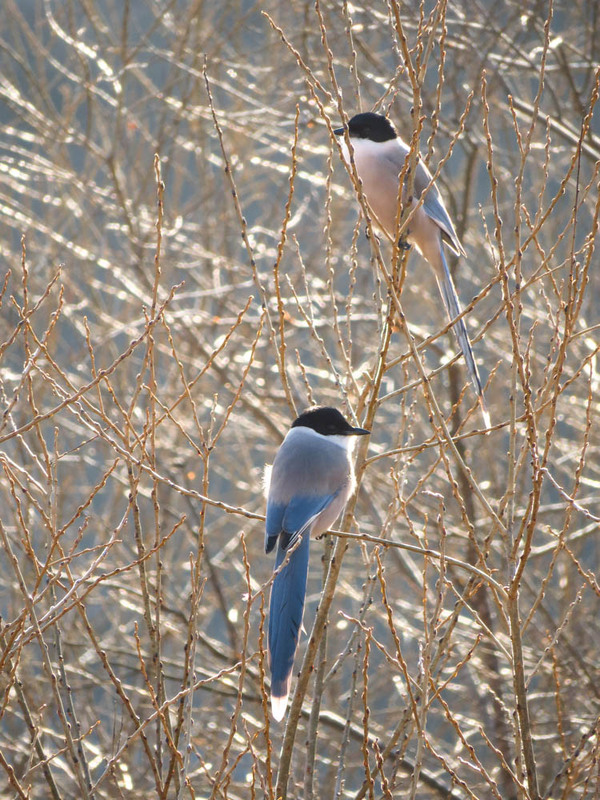 These are Azure-winged magpies. Not only did I learn that, but I also learnt how to pronounce ‘azure’. This was what I accomplished while Caroline was oiling her bike chain. This was our last big cycle. After this, we would pack our bikes and become train travellers again. Winter in Siberia was our next destination after Korea, and cycling through -30° weather is for people braver than us. With that in mind, we looked upon the large climb through the park with new eyes. 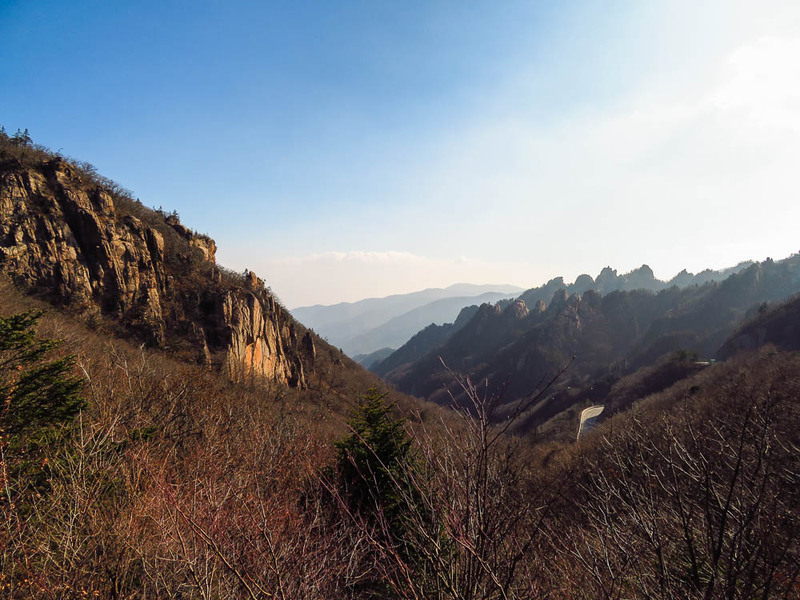 Instead of seeing it as a horrible obstacle, we took our time and enjoyed the mountain. Enhancing our enjoyment was a tail wind going about the same speed as us. This is the best kind wind, not only for the obvious reason of making pedalling easier, but also because the world becomes very peaceful without gusts in your ears. There was virtually no traffic, so we could hear the late autumn trees rustling, and our tyres crunching up the road. We could hear the birds skittishly swapping branches, and we could hear the very occasional approaching car, giving us enough time to veer away from our preferred spot: the middle of the road. 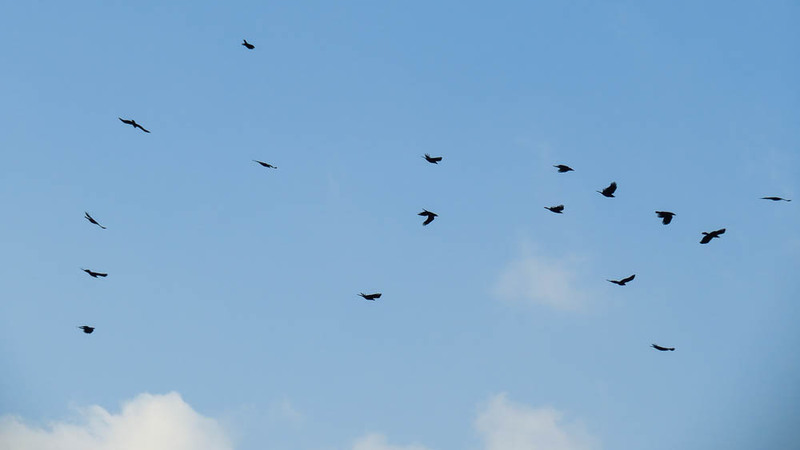 Apparently crows also migrate. But they seem far less organised while flying. Near the top of the pass – 1,004 metres high – a car slowed down opposite us. The couple inside gave us a look of awe and a thumbs up. I managed a quick return thumb, and gave them a grimace that was meant to be a grin. At the peak there were a few sightseers and a restaurant. We celebrated our last big climb for the foreseeable future with a tasty bibimbap. The wind picked up considerably at the top, and brought with it an uncomfortable chill. Our initial ride down was probably more difficult than the ride up. It was very steep, which meant lots of braking, and the icy air worked its fingers through our shoes and gloves. The terror wasn’t to last long; the gradient for the second half was more fun than scary. 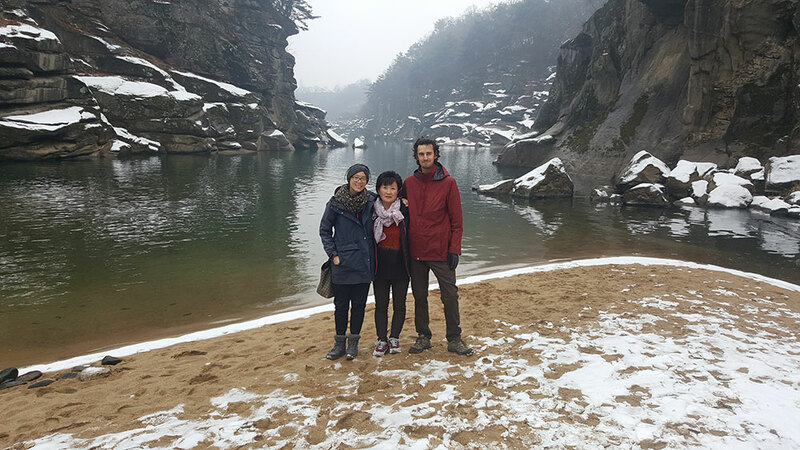 We needed to book a place to stay for week in Yangyang. I was waiting for some documents to arrive from New Zealand, and Caroline had an important Skype call to make, so we needed a definitive address. We booked a place using Agoda. When we arrived at the Guesthouse they didn’t even know we were coming. In fact, they were closed. It was only when we told them we’d already paid did they allow us into a room. We were the only people in the three-story, 18-room motel (for that’s what it really was, not a guesthouse). And so here I sit in that lonely motel, finishing off this post. Some time next week we will make the short cycle down to Donghae, then hopefully board a boat to Russia. What will you do with the bikes? Looking forward to more stories… trans siberian? Epic indeed! Well, the bikes are packed up for now, and our next few tales will be direct from the Trans Siberian. I’m writing this from Vladivostok. It is a completely different world here!